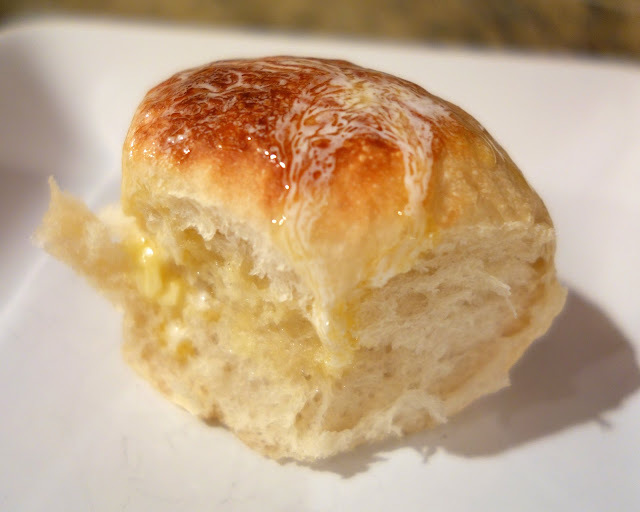 Slow Cooker Dinner Rolls - who knew you could use your slow cooker to bake rolls?!?! Great for the holidays when your oven is full. I've been seeing some posts on Pinterest about making bread in the slow cooker. I decided to give it a whirl. Let me tell you, this is GREAT! It is so easy and only takes about 2 1/2 hours from start to finish. This is my new go-to method for making Rhodes Rolls. I used a 6 quart slow cooker and baked 9 rolls. You will need to adjust the amount of rolls depending on the size of your slow cooker. The cooked rolls right out of the slow cooker are not brown on the top. They are done, they just don't look done. To remedy that, I stuck the rolls under the broiler for about 90 seconds. They had a nice color and tasted great. 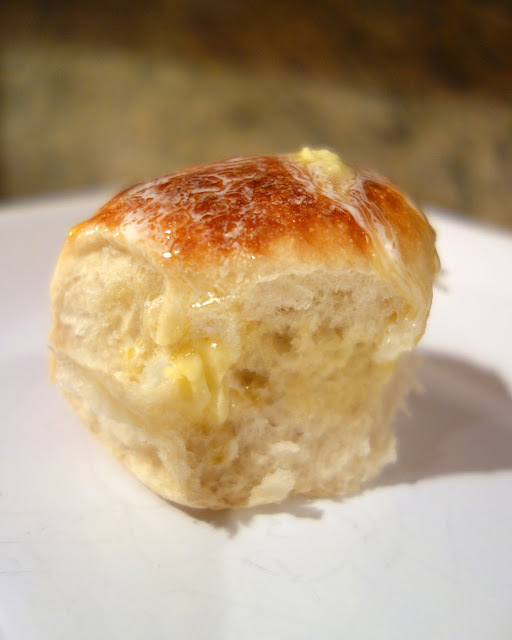 Who knew you could make rolls in the slow cooker?! So cool! Line a 6-quart slow cooker with parchment paper. Lightly spray with cooking spray. Arrange bread dough in slow cooker. Turn slow cooker on LOW and let bread thaw and rise for about 1 hour and 15 minutes. Once rolls have risen, turn slow cooker on HIGH. Let bread cook for about 1 hour and 15 minutes, until done. Place rolls under broiler for 90 seconds or until golden brown (if desired). Serve with butter. I've never heard of these rolls. How long do they take in a regular oven? I've never seen slow cooker rolls on Pinterest either, but that's way less energy usage than the oven, so maybe I'll make some once in a while now. I knew you could make cakes in the slow cooker, so it makes sense. It looks amazing, thanks Stephanie. Mimi - great idea to turn them over! I will have to try it. Do I just buy frozen rolls? Sara - buy the frozen roll dough - not frozen precooked rolls. I buy Rhodes frozen roll dough. Have you tried this with the Rhodes cinnamon rolls? Should work the same right? I haven't tried this with the cinnamon rolls. It should be the same. Let me know how it turns out if you try it. Where do you find this frozen roll dough? I've never seen it! I buy it in the freezer section at Walmart. 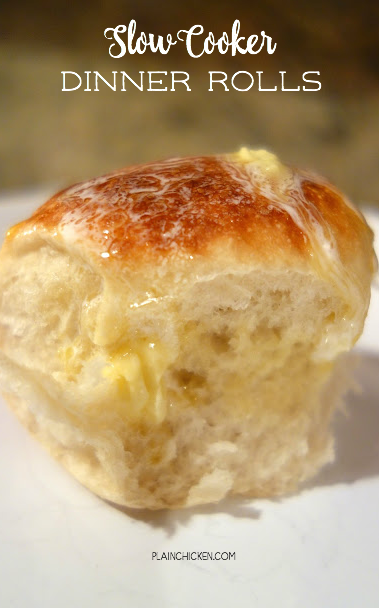 I wonder if you could use homemade dough that has been frozen into rolls (unbaked)? They are completely edible after cooking in the slow cooker. I chose to brown them for a minute under the broiler for looks. Thank you! Using this method for Thanksgiving, I forgot to buy bread! Wow! 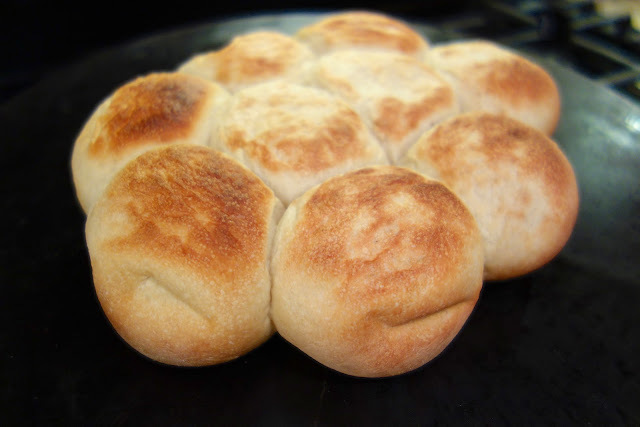 I am excited to try this with my own home-made dinner rolls. I just made some yesterday and put three dozen in the freezer before baking. Thank you for the idea. I will try this with my dinner tonight. May we please receive some suggestions for good quality slow cookers? Every slow cooker we've ever bought, without fail, cooks too hot ... even on the simmer setting. Perhaps we're not spending enough and therefore getting cheaply made cookers. Please help, and thank you in advance.